For active guests, there is much more to enjoy than just Berzdorf Lake. Cyclists can choose from numerous cycle paths, but the Oder-Neisse-Cycle Path is probably the most beautiful one. Covering altogether 630 kilometres, it leads from the source of the Neisse River in Nová Ves, Czech Republic, to Ahlbeck on the Island of Usedom at the Baltic Sea. Along this route, Görlitz is one of the most popular destinations to stop and stay for visit. The Neisse River being the border river between Poland and Germany is popular among paddlers and canoeists, too. You can start your discovery tour daily from April to October, renting a dinghy suitable for rafting, a canoe or a rowing boat at different piers along the river. The little green triangle showing a blue river in the middle, the symbol for the Oder-Neisse-Cycle Path, sets the direction. According to the signs, you get to Zittau travelling about 40 km down to the south, and to Rothenburg going 28 km up to the north. To reach Bad Muskau, the spa resort and Pückler-Park site, cyclists have to cover a distance of 65 km. During the summer, you can start an active discovery journey along the Neisse valley north and south of Görlitz going on a boat trip or a paddle tour. Enjoy nature and just take it easy. There are rental stations, for example, at Obermühle Görlitz, in Rothenburg, Bad Muskau and Rosenthal. Under the slogan "Hiking without Luggage" you are invited for a unique journey through the varied landscape of the low mountain range. 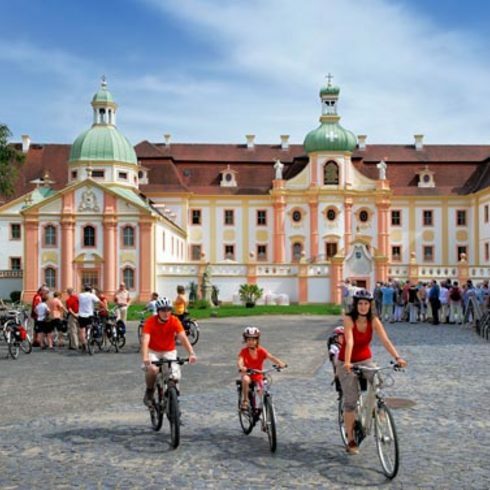 On this tour, taking you around wonderful nature and cosy towns and villages for several days, you are going to pass the best-known peaks of the Upperlusatian Mountains, covering six stages with a total length of 118 kilometres. Leaving Görlitz to the west, it takes you about 20 minutes by car to reach the nature reserve of the Königshain Mountains. Not only climbers enjoy the free-standing granite rocks and quarry walls. Roaming the woods, hikers will discover numerous dreamy quarries, witnessing 200 years of hard work in the mines. Less than a 1-hour drive away from Görlitz, Germany’s hundredth nature park invites you for hiking and climbing, biking and mountain biking, skiing and sleighing. Even if you just want to relax, you will find a wide range of offers: the narrow-gage railway, Oybin Castle and Monastery, or the unique timber-framed houses called Umgebinde-houses – you will, for sure, not get bored in the Zittau Mountains. To discover the region of Upper Lusatia-Lower Silesia by bike can be a very attractive way to combine the pleasure of riding, relaxing out in the nature, and getting to know traditions and history of Upper Lusatia at the same time.